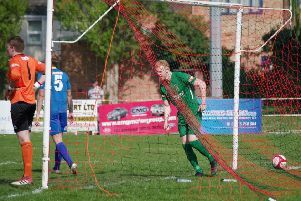 Brighouse Town indicated that they may be capable of a promotion push in the Evo-Stik NPL East section with a stunning 4-1 home win over second-placed Lincoln United yesterday. The visitors arrived at Hove Edge in excellent form but Brighouse dominated the contest. Town shrugged off the disappointment of falling behind against the run of the play and surged to victory with the help of stunning strikes from Adam Jones and Tom Robinson. Brighouse, who stay fourth, made the bright start Powell had asked for and were in charge for 40 minutes, a Sam Wright effort hitting the top of the post and bar. Lincoln only found their feet in the closing stages of the half but took the lead, as Powell had feared from a set piece, seconds after the break when Matthew Wilson stabbed home a free-kick. Brighouse were only behind for three minutes, Jones’s fine strike from the edge of the box flicking the inside of the post as it went in. Zeph Thomas failed to beat the ‘keeper one on one but great work from Aaron Martin enabled Mohammed Ibrahim to slide the ball past the keeper for 2-1 on 56 minutes. Town made it three goals in 15 minutes when Adam Field’s shot went under the keeper, the Town skipper following up to make sure. Robinson put the icing on the case two minutes into added time with a 25-yard effort into the top corner. Brighouse will check on knocks to Ibrahim and Jones before Tuesday’s trip to play Ossett United in the quarter-finals of the West Riding Cup.